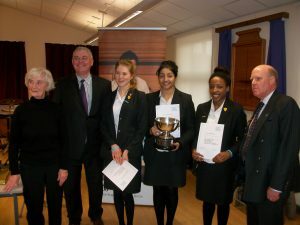 Nathania, Aditi and Olivia will represent the region at the National finals of the ESU (English Speaking Union) Public Speaking competition held at Cambridge University on Saturday 26th April 2014. They have successfully battled their way through the regional heats held in Leeds and are now preparing to compete in the finals against eight teams from across England and Wales to try and win the title of national champions. 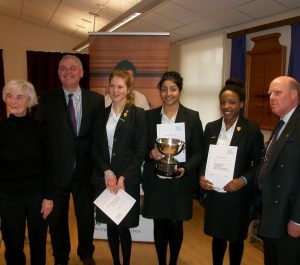 At the finals each member of the Red House team will take on a specific role – Aditi will be the Chairperson; Nathania will be Speaker and Olivia the Questioner. Each role has its own skills and is demanding in different ways. The role of the Chairperson is to introduce the Speaker and their topic, call on the Questioner and the audience members to put questions to the Speaker and summarise the overall presentation as part of their conclusion. The role of the Questioner is to ask probing questions with a view to eliciting more information from the Speaker and expanding the discussion as a whole. The competition develops not only the pupils knowledge of topical issues but enhances their speech writing skills, their speaking and presentation skills and their ability to think analytically on their feet, as well as developing confidence. “We are extremely proud of Nathania, Aditi and Olivia in reaching the finals of this prestigious competition representing both Red House School and our region. We consistently perform very well in public speaking and this is the second year running that we have reached the finals of the ESU competition. Nathania has also gained success earlier this year by competing in the finals of the National Poetry by Heart competition. We wish them the very best of luck in the finals.